Check out the Dark Demons Night 2017 candidates! We are delighted to see the Dark Demo(n)s concept has crossed our national borders and has been picked-up by eager to play bands all over the world! Check the out on our Dark Demons Night page (link below) and cast your vote(s) here! 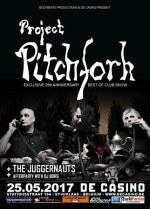 Project Pitchfork is a German electro band, founded in 1990 in Hamburg. It is among the most successful and influential representatives of the dark electro genre, which one characterizes decided since the early nineties and led to unprecedented results. The two driving forces behind the band until today Peter Spillesand Dirk Scheuber. Because Peter came from Hamburg, and Dirk came from the new federal Eastern states, Project Pitchfork band are considered first "German-German" band at all. In November 2016 Project Pitchfork released their 16th studio and critically aclaimed album 'Look up, I'm Down Here'. Belgian NU-EBM heads The Juggernauts will have the honor to open this night presenting their latest album 'The Juggernauts Are Coming'. Don't forget to check-in on our Facebook event here! 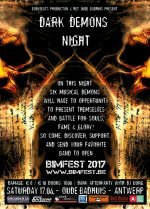 Dark Demon(n)s wanted to play BIMFEST 2017! We’re happy to announce that also this year we will organize a Dark Demons Night. The MOST IMPORTANT GOAL of this night is to GIVE BANDS A OPPORTUNITY to present themselves LIVE in the BEST CONDITIONS. This means on a REAL STAGE, with a PERFECT SOUND-SYSTEM and professional LIGHTS. A pleasant extra of playing our Dark Demons nights is that the audience can choose 2 bands who may open BIMFEST 2017. Also good to know is that only 6 bands will be selected for this Dark Demons Night so your band will have a 1/3 chance to play BIMFEST too! So if you are interested and you think your music style fits our festival, please send us (BodyBeats Belgium) a private message with your information and email address so we can provide you the general conditions. This is your chance to play at BIMFEST, so bring it on! AND DON’T FORGET TAKING PART IS MORE IMPORTANT THAN WINNING! PS: This year our Dark Demon Night is also open for foreign bands! New DIVE album 'Underneath' + 2017 tour announced! The new DIVE album "Underneath" from Dirk Ivens in collaboration with Ivan Iusco (Minus Habens) and Rafael M. Espinosa (Geistform) is scheduled for April 2017 and coming out on the German based label Out Of Line. DIVE will tour extensively in 2017 in order to promote his new album. Last time to see Agent Side Grinder perform in Belgium with their current Line-up! Charismatic singer Kristoffer Grip has decided to quit Agent Side Grinder due to lack of time in his current life. Following his decision two other members, Henrik Sunbring and Thobias Eidevald, have also decided to leave the band and move on. Original Agent Side Grinder founders Johan Lange and Peter Fritstedt however will not trow in the towel on their baby and will continue with the band, fulfill their vision and record a new Agent Side Grinder album for Progress Productions in 2017. Luckily this drastic and sudden line-up change will not jeopardize the upcoming and scheduled concerts this spring. They will still take place in the original 5 piece line-up. But these concerts will be the final opportunity to see Agent Side Grinder in this constellation! 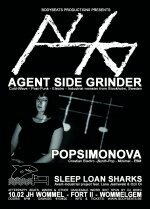 One of those last opportunities will be on February 10th @ JH Wommel - Wommelgem - Belgium where Agent Side Grinder will perform together with the Croation bands Posimonona & Sleep Loan Sharks.